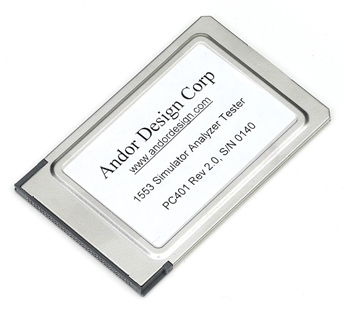 Andor Design Corp. specializes in high performance low cost interface cards for the Avionics MIL-STD-1553 serial multiplex bus. Each card is feature rich and provides the benefit of a universal MIL-STD-1553 card capable of performing all the required tasks associated with simulation, testing, monitoring, data communication and Production / Validation test plans of the various components of the Avionics Bus. A common data structure for all cards, ISA, PCI, PCMCIA, provides the added benefit that an application written for one card is usable for all others. Software with source code is included. User has the choice of 1553 A, B or McAir protocols through program control.